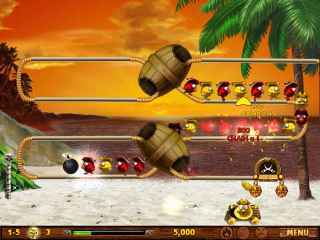 Free Download Bird Pirates Game or Get Full Unlimited Game Version! Avast me beauties! 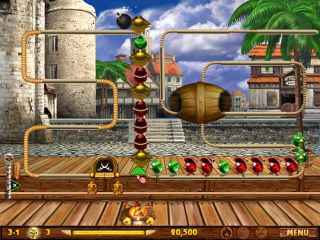 Join the crazy, colorful Bird Buccaneers as they sail through the Caribbean on their exciting adventures! In order to get advantaged of playing Bird Pirates full unlimiteg game version you must register the game. Avast me beauties! Sail away on a buccaneering adventure and visit seven different islands as you travel through the Caribbean. Your mission is to send the Bird Pirates to their rightful home... but beware! You'll have to shoot the birds from their rope, but in the right color order. There are dangers lurking on the high seas and you'll have to use all your skills to achieve your goals! 7 Bonus Mini Game Levels! What Do Pirate Birds Do For Laughs? Find Out! During a trip to a tropical paradise, all seems peaceful. But as usual, things don't go as expected. The jungle hides many secrets, will you be able to reveal the mystery of the Golden Bird? Discover the tale of Crimson Jones and his 10 hidden treasures! Make your way through the southern isles, plundering and pillaging, pirate-style! Defend your fortress against the Pirates of the Atlantic with the help of some lead, a cannon, and a lot of gunpowder! You're really in the money with Pirates Plunder...a Pirate-themed slot machine game with the lucrative Treasure Feature and Jolly Jackpot bonus!